The year was 2003. I was working on my first website out of college. It was a personal portfolio geared towards landing my first job in the industry. I was trying to build a site unlike anything prospective employers would have seen before. The grungy homepage wasn’t built with tables as my college education had taught me. I needed to create layers to allow my random Polaroid photo to change beneath its frame, so I used a bizarre element called a <div>. It was alien to me, but it worked. There was only one catch: Of the modern browsers of the day, it only worked on Internet Explorer 6. It was frustrating to think that my site would only work for those who kept their browsers up to date. When it came out in August 2001, IE6 was slick. For a couple years, it was the standard by which other browsers were measured. There was actually a period when it was the browser of users in-the-know (like Google Chrome or Mozilla Firefox today). 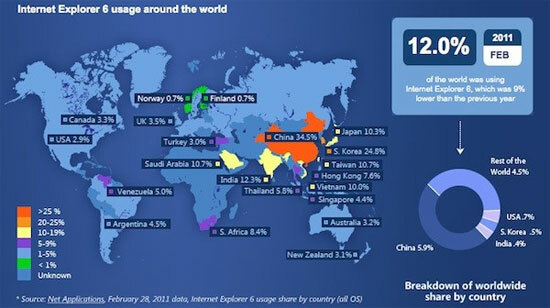 For a time, Internet Explorer enjoyed an incredible 95% market share across the globe. Think about that. That is a staggering statistic that will probably never be repeated by a single web browser again. For five years, IE6 ruled the web almost completely uncontested. This is why it’s so well rooted today. Large organizations, companies and even the government began to use IE6 extensively, and they developed intranet applications that, in many cases, will not work in any other browser. For some, switching would mean incurring millions of dollars of development and testing. Ironically, my desire for people to use IE6 back in the day would become my burden as a web designer later on. People adopted Windows XP and IE6 in droves — but five years later, they didn’t upgrade their browsers as readily. People were just comfortable using IE6. The problem began in 2006. Microsoft announced the release of the new and improved IE7, so one day during work I installed the upgrade. I would soon realize that sites did not render the same in the two versions of IE. To my horror, I would realize that — not only could I not rely on users upgrading their browsers — but that I would, in fact, have to test sites I made on both versions. It was an inconvenience I thought would only last a few months. Two years later, IE6 usage was still beating IE7 in many regions. Today IE6 is still considered by many to be one of the worst tech releases of all time for its lack of support of web standards and for its security flaws (as any product receiving patches monthly for a decade should). For the last few years there have been some dazzling campaigns against the browser, from the IE6 Funeral and Crash IE (which literally kills the browser), to websites listing all the things younger than IE6 (which includes digital SLR cameras, the iPod, and Xbox). For nearly five years now, making sites backwards compatible for this aging browser has been a fact of life. When building a new site, it’s just a given that an IE6-specific stylesheet is going to be needed to hide advanced content and to hack layouts to work around the browser’s bugs. Last Friday, I read a startling tweet from Microsoft announcing the impending demise of the browser. For years, the usage has been in slow decline, and it seems that finally even its manufacturer is calling for users to make the switch. IE6 Countdown, by Microsoft, is rallying the final holdouts to do their part to get the browsers usage down to 1%. My surprise was only multiplied when, that same day, I started hearing about large corporate clients announcing that they were in fact no longer concerned with IE6 compatibility. It was the moment I’ve been dreaming of since 2006. I then felt something unexpected. Even as a front-end developer who suffers the worst of IE6’s drawbacks, I’ll admit I actually felt a small pang of sadness and nostalgia at the news. IE6 will always have a prominent place in Internet history, but the time has come to move on. If you or your company are still using IE6, I would whole-heartedly encourage you to upgrade to something more modern. 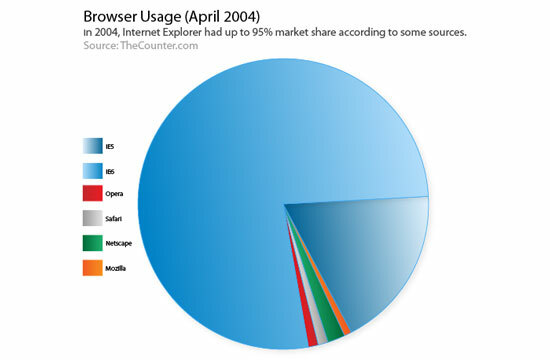 Excellent browsers are free, and the improvements made since 2001 (the birth year of IE6) have been vast. In terms of presentation, capability — and perhaps most concerning, security — IE6 can’t begin to compare to today’s browsers. Many of them will even update themselves rather than let your system age into obscurity.